Police Scotland has been taking part in a multi-agency day of action to target bogus workmen in the south east of Glasgow. 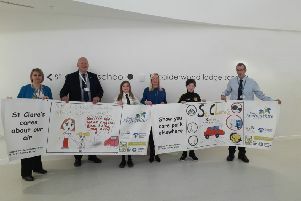 Local officers were joined by the Divisional Road Policing Unit, the Driver and Vehicle Standards Agency (DVSA) and Trading Standards at two road stops in Cathcart Road at Crown Street and Carmunnock Road. They were specifically targeting trade vehicles in order to detect road traffic, trading standards and other offences as well as gathering any potential information regarding bogus workmen. Sergeant Michael Trueman from Cathcart Police Station said: “The main focus of the operation was to send a clear message that bogus workmen will not be tolerated and we will work with our partners to detect and deter any criminality. “It was also an opportunity for us to engage with legitimate tradesmen and for Trading Standards to offer relevant information and advice.